The kernelci.org project aims to improve the quality of the mainline Linux kernel by improving testing and validation across the wide variety of diverse hardware platforms that run Linux. There are so many different devices and platforms that run Linux, and Linux kernel development is moving so quickly that it is difficult to ensure that any given platform will remain working and stable with each Linux version. 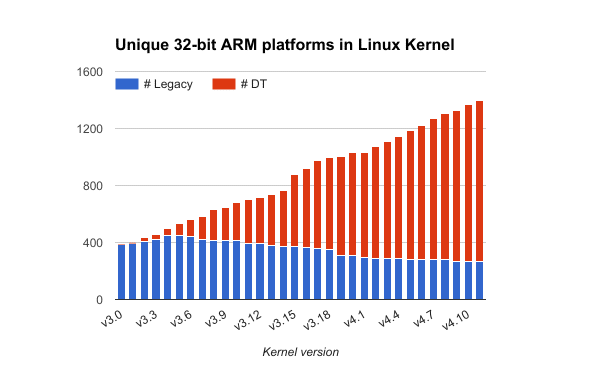 As an example, the chart here shows the growth in the number of 32-bit ARM based devices supported by Linux, with the total number of unique devices as of v4.11 just shy of 1400! That doesn’t even count the growing number of 64-bit ARM devices or any of the other architectures like x86 or MIPS. With such an incredible range of supported hardware, how can the Linux kernel community continue to ensure that all of this hardware remains well supported and evolves with the rest of the Linux kernel? The kernelci.org project set out to help solve that problem. After a successful build, the kernel images are made available to the several distributed labs for testing. 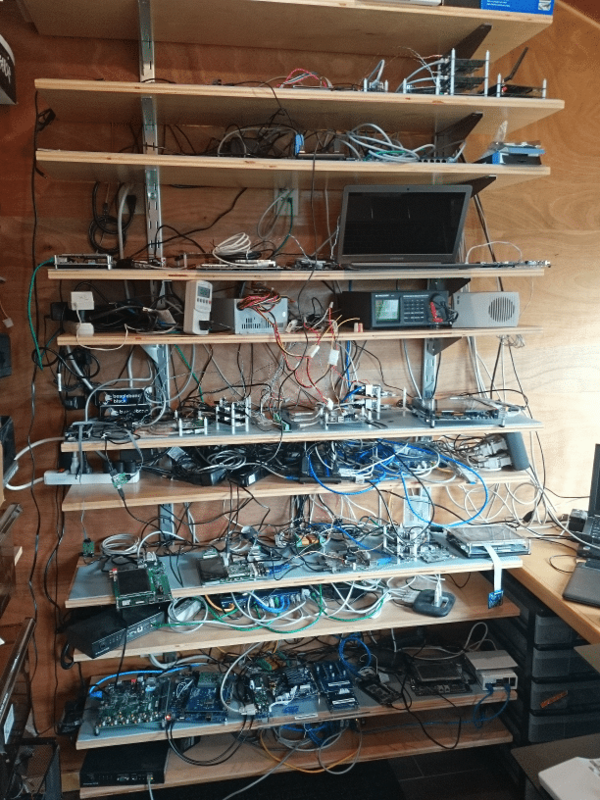 Due to the diversity of hardware that runs linux, no one lab is going to have all the hardware, so kernelci.org was designed for distributed testing. When builds are completed, each lab can download the images for the hardware available, and perform the testing. Currently there are 8 active labs contributing a total of more than 250 unique hardware platforms across 4 unique architectures. BayLibre’s Kevin Hilman is a founding developer of the kernelci.org project, and today, BayLibre has the largest lab contributing results from over 80 unique boards across 25 unique SoC families and performing thousands of tests each day. If you have hardware you’d like to see tested with the latest Linux kernel in the kernelci.org project, feel free to contact us. We can help guide you through setting up your own lab, or you could just send us your hardware and we can add it to our lab. Last week, BayLibre team attended the Embedded Linux Conference North America 2017 edition in Portland, Oregon. In this particular edition, Patrick, Fabien and Neil talked about Power Instrumentation, Zephyr and Amlogic Mainline Linux status.